— Forty years ago today, Stephen B. Clemmons was assigned to Launch Complex 34 at Cape Canaveral, Florida. The events that would unfold on Jan. 27, 1967, would forever change the course of the United States' space program and Clemmons' life. 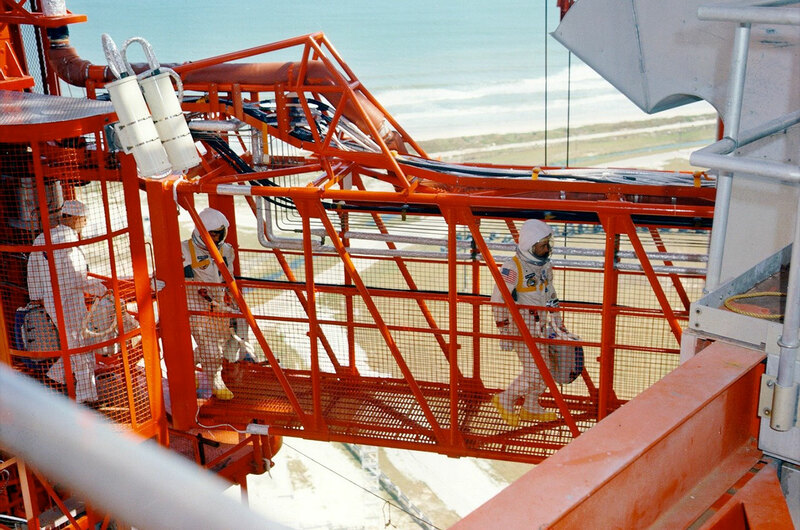 The crew of the first Apollo mission, scheduled to launch on February 21, 1967, were at the pad to run a test inside the spacecraft that would take them to orbit, kick starting the nation's efforts to land a man on the Moon before the Soviets. With less than three years left in the decade set by the late President John F. Kennedy to accomplish the lunar landing, NASA was under pressure to launch Apollo 1. Virgil 'Gus' Grissom, Edward White and Roger Chaffee were already strapped and sealed inside Apollo 204 for a "plugs-out" test when Clemmons arrived at Pad 34.
collectSPACE spoke with Clemmons about that ill-fated January day. SC: This was to be the last major test of the spacecraft called the "Plugs Out Test," which would simulate the liftoff of the spacecraft during an actual launch. The umbilicals, the only connection between the spacecraft and the ground control systems would jettison or drop away from the spacecraft, cutting off all ground control signals and the spacecraft would go on its own internal power and control systems. SC: There was a slight pause, we could hear some cross chatter in the blockhouse, then we heard, "We have a fire in here, get us out!" No one has really been able to tell what was said, it was followed by "there's a fire in here," then a few seconds later, we heard a piercing scream and then silence. cS: What did you and your coworkers do? SC: All hell broke loose as Jim Gleaves, Jerry Hawkins and Donald Babbitt scrambled from the clean room out to the catwalk that led into the White Room. Then the whole floor erupted in fire and bits of burning debris as the spacecraft seemed to explode. Heavy biting black smoke began to fill both floors, blocking out all light sources except for the flames coming from the spacecraft. Burning bits of insulation were flying into every corner. I attempted to contact anyone in the blockhouse, particularly the ECS engineer to see if they wanted the [oxygen] panel shut down or left on. If there was a chance that the crew had survived, I would be shutting off their O2. If I left it on, I would be feeding the fire. About sixty seconds later, the fire in the clean room drove me out onto the catwalk. I left [the panel] on and ran out to help the crew that was fighting to get into the craft. cS: What did you find at the White Room? SC: Those that had made it to the White Room, a small room that provided access to the spacecraft were driven out by flames and smoke, making it impossible to get to the hatch. They backed off to regroup. They didn't have any type of firefighting equipment, or gas masks and were wearing clean room nylon gloves which by now had melted and were discarded, along with their nylon shop coats which had melted in the first few seconds. They went back in seconds later just as another blast of hot smoke and burning bits of insulation rained down on them. They couldn't wait for firemen and would take turns to go into the fire and smoke, holding their breath as long as they could. LD Reese, a NAA Quality Control Inspector and I joined them and together, taking turns after gulping fresh air went into the White Room for short periods to unlatch the hatches. Four minutes later, Jerry [Hawkins] and I were on the last relay, the last hatch fell inside. I was able to get just inside the burned out hulk because the hatch had only fallen a foot or so to look for survivors and get a look at what was inside. cS: What did you see inside the spacecraft? SC: That first look has always been a haunting reminder that we had lost our crew that day and remains as clear today as it did 40 years ago. I yelled for anyone to answer, just hoping that someone had survived, but it was just silence, just the crackling noise of cooling aluminum and a gentle squeal of oxygen coming from where the ECU [environmental control unit] had been. Jerry followed, going in just a bit further, then LD went in all the way, but the spacecraft was silent. LD thought that he heard voices but it was just the squealing noise of the venting oxygen. We had lost our crew, spacecraft and almost our lives. cS: What happened in the weeks and months afterwards? SC: There was a three month lull in all activities except those required on the disassembly of the spacecraft. After the investigation ended, we [NAA] went through a complete reorganization of men and management and new training was mandated. This went on for many months as new procedures were worked out. In order to work on the tower, now everyone connected to the spacecraft and ground support went through a rigid training program that involved firefighting, ground and flight crew rescue, pad safety, and schooling on the new spacecraft and its systems. We trained on how to get off the pad, either by the elevators or cable car within a certain time frame. 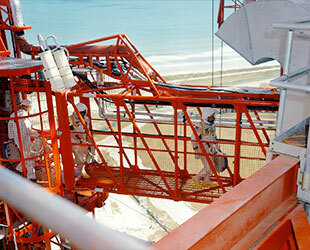 Each man had to go before a review board to certify on each system and all safety procedures. Over four hundred NAA and NASA technicians and engineers were certified during the next 18 months. Some men were sent back to Downey [California] to work as well as train on the new Block II vehicles which were going through a complete shake down and overhaul. I've often said that they re-invented the wheel, but in this case a new moon program. Under the threat of having the program cancelled by Congress, they went back to basics. It was a complete 180 degree turnaround and for us, we welcomed the new changes. cS: How did the period before the fire differ from the time afterwards? SC: I think the days before the fire and after the fire were as different as day and night in the overall operations. Before the fire, there was utter chaos. When Apollo 7 arrived, same crews, but a very different attitude. Now the professionalism in each of us came out and it made a big difference. With the memories of Apollo 1 still fresh in our minds, we were determined that it wouldn't happen again. No longer would we accept someone's word that something wouldn't happen, we had to make sure it didn't. cS: In your opinion, would we have successfully reached the moon had Apollo 1 not occurred? SC: No, because there were too many things wrong, both with the spacecraft and NASA operations, which were discovered during the investigation of the fire. There were fatal errors, most hidden from view that would have surfaced if we had continued. It's very possible that we would have had a catastrophe on the ground, possibly the destruction of the Saturn V with many deaths or we could have left men on the moon and in orbit. cS: What do you remember of the day of the fire that the public may not know? SC: I remember we had discussions that afternoon on the way up to the spacecraft level that no one was prepared for any type of accident. It was being treated as a routine test and we all knew that it was dangerous because of the pure oxygen atmosphere and the fact that it was in the top of a 220-foot tower, many minutes away from anyone that could help us. We wondered why the rescue teams that were used in the [earlier] altitude chamber were not being used today. But most of all, we were wondering who or what group of idiots had determined that the test was not hazardous, because in all the years at Cape Canaveral, any time oxygen was involved it was considered highly dangerous. cS: What similarities and differences did you see between the Apollo 1 fire and the loss of Columbia and Challenger? SC: One factor that all three accidents had in common was the shortage of funds and a lack of quality control and safety requirements. Lackadaisical attitudes and apathy among the workers added to the overall problems. NASA had the money, but it was being spent elsewhere to maintain their worldwide operations, provide grants to colleges, hospitals, universities and to increase the size of NASA. They were running the flight programs on bare bone budgets and the needed safety improvements were ignored because it would take important time out of the schedule. They violated every known rule [with regards to] crew safety: manual hatch, open wiring, flammable material inside the cabin, incomplete testing requirements, but most of all, added modifications right up to the day of the test. All professional opinions about the dangers which had been studied, hashed and rehashed, had been ignored. The same problems came up on the Challenger. They ignored ground safety data, flight equipment test data and violated flight safety rules to make rigid flight schedules set by Congress. The needed changes were ignored, or put off because of a lack of funding. The problem with the solid rocket boosters' seals were well known for at least 18 months before Challenger, even to many of us outside the program, but they wanted to get one more flight. It would be too expensive to make the changes and hold to the flight schedules. Both shuttle disasters were the result of the same overall root problems. A rush to flight without consideration of flight safety rules, a shortage of funds to keep the fleet going, with many serious problems that needed correcting being signed off as insignificant and a business as usual mental attitude. cS: What are you feelings about displaying the Apollo 1 spacecraft today? It's currently hidden from public view at Langley Research Center in Virginia. SC: I feel that it should be displayed at Kennedy Space Center in a special section apart from the astronaut memorial and not on Pad 34 as a reminder to America that it must never happen again. The story of Apollo 1 should be told over and over again because it's not just about three men who were killed, but it is more about the conditions that created the fire. We must always be reminded that it can happen again. Men and women who go to space deserve the best and nothing must be left to chance. This display would tell the world that there is danger in all aspects of rocketry. cS: How did the loss of Apollo 1 change your life? It has remained a constant reminder over the years that nothing can be taken for granted. We must remain ever vigilant. I spent the next thirty years after Apollo 13 in the new construction industry, the second most dangerous business in the world and as a manager, I put safety of the men foremost. I never had a fatal accident and never had to tell a wife or family that their husband or son would not be coming home. Many have asked me over the years "Why were you so strict on safety?" My answer, "Because I lost one crew when it could have been prevented during Apollo and it will never happen again."